The GBP/JPY pair is on bids around 147.80 during early Wednesday. 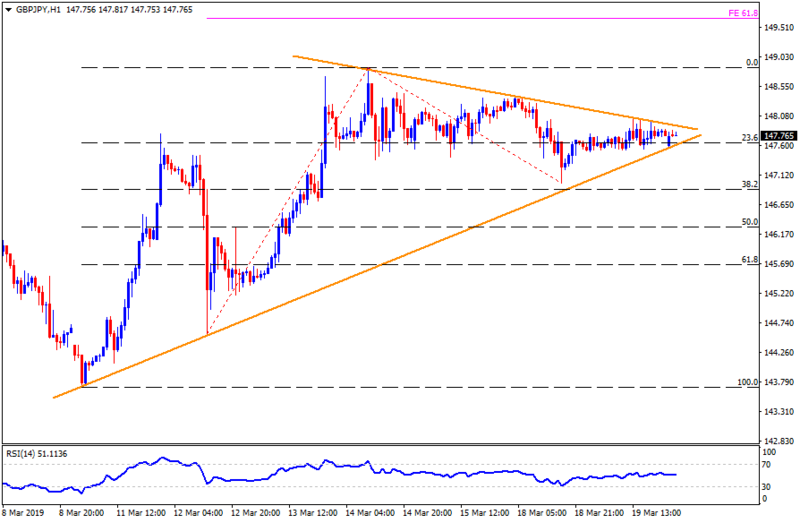 A week-long triangle formation limits the moves between 147.50 support and 148.00 resistance. Should the pair rallies beyond 148.00 resistance, 148.40 and current month high around 148.90 can come back on the chart. Though, pair’s rise past-148.90, also clearing the 149.00, could help prices to aim for 61.8% Fibonacci expansion (FE) of March 12-18 moves at 149.70 followed by 150.00 round-figure. In a case where the quote slips under 147.50 support, 146.70 and 50% Fibonacci retracement around 146.30 may become sellers’ favorites. Also, pair’s sustained downturn beneath 146.30 might not hesitate to drag it towards 145.30, 145.00, 144.80 and 143.70 consecutive supports.